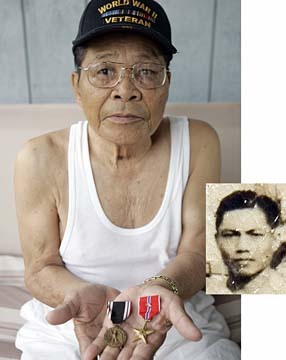 World War II Filipino veteran Manuel Pablo, 88, holds his Bronze Star and POW medals. At right is Pablo in 1945. Manuel Pablo crouched in foxholes to defend the Philippines against invading Japanese soldiers in World War II. He says he watched a Japanese guard stab one of his comrades to death with a bayonet during the Bataan Death March when the starving prisoner of war asked for another bowl of rice. Even though Pablo risked his life for the United States, which controlled the Philippines as a commonwealth at the time, his children can't win approval to live with him in America during his retirement. Scholars and veterans' advocates say the policy reflects decades of neglect, dating to 1946 when Washington broke wartime promises that the soldiers could become U.S. citizens and enjoy the same pension and medical benefits as American troops. The federal government has since belatedly fulfilled those commitments, but only in the past two decades and only in fits and starts. Some issues remain unresolved, like resident rights for the children of veterans. Today, thousands of elderly veterans -- including those wounded in battle and awarded the Bronze Star and other medals -- are living their last years far from their children and grandchildren because of U.S. immigration rules. "I feel lonely whenever I think about them," Pablo, 88, said during an interview on the wooden porch of his home in Waianae. "If only they were here." Veterans and their backers say the need to reunite divided families only grows more urgent given the advancing age of the veterans. There are as many as over 50,000 Filipino veterans of World War II alive today. Some 10,000 are said to live in the United States, including 2,000 in Hawaii. Most are in their 70s and 80s. Pablo enlisted in the Philippine Scouts, a U.S. Army unit, after a recruiting truck drove through his hometown of San Nicolas in Ilocos Norte province. When the Imperial Japanese Army invaded on Dec. 8, 1941, he and his fellow soldiers dug foxholes to fight against troops shooting at them from the jungle. He recalls hunkering down between the corpses of fallen comrades, using their bodies to shield himself from bullets. Other Filipinos formed the resistance against Japanese troops after U.S. forces surrendered at Bataan and Gen. Douglas MacArthur withdrew to Australia, uttering the famous phrase, "I shall return." Belinda Aquino, a University of Hawaii political science professor, said the U.S. "dumped" Filipino veterans after World War II. Their cause fell out of focus in the postwar years as the U.S. worried about communism. "The Philippines was just not an important priority for the U.S.," she said. It took Washington 45 years after the war to offer veterans a proper chance to obtain citizenship. Yet the Immigration Act of 1990 only allowed each veteran to bring one immediate family member to the United States. The shortcomings of that law have left the sons and daughters of the veterans with little choice but to get in line for immigration visas along with everyone else. On average, they must wait about 20 years because so many Filipinos hope to emigrate. Pablo's three sons and four daughters have been on the list since 1994, two years after he immigrated to Hawaii and became a U.S. citizen. Sen. Daniel K. Akaka, D-Hawaii, reintroduced a bill this year to remedy the situation. It would allow children of Filipino World War II veterans to sidestep the waiting list. The measure died last year when it was included in a large omnibus immigration bill that was derailed by disagreements over a border fence and making English the national language. Akaka is optimistic the Senate will pass the reunification legislation this year, said Jon Yoshimura, an Akaka spokesman. The Veterans Affairs Committee, which Akaka chairs, plans to hold hearings on the issue next month coinciding with the 65th anniversary of the Bataan Death March on April 9. Sen. Larry Craig, R-Idaho, the ranking minority member of the committee, has not taken a position on the bill, his spokesman said. Other lawmakers plan a bill that would give full pension and disability benefits those Filipino veterans who have been denied the same benefits as former American soldiers. Members of the Congressional Asian Pacific American Caucus said Wednesday they would support the measure. Pablo could live in the Philippines near his children. But he prefers to live in the U.S. where he can access the medical care he needs at veterans' hospitals. He still takes medicine and receives therapy for post-traumatic stress disorder. The war memories from six decades ago still haunt him today. "When he gets nightmares, he's shaking. He's saying 'Can you cover my face? They are coming,' " said his wife, Fely Pablo. "He says 'The Japanese are coming!' "